From the ‘people’s pope’ that has captured the hearts and minds of millions with his simplicity in just a few months, Pope Francis has now been elevated to the role of Superman. 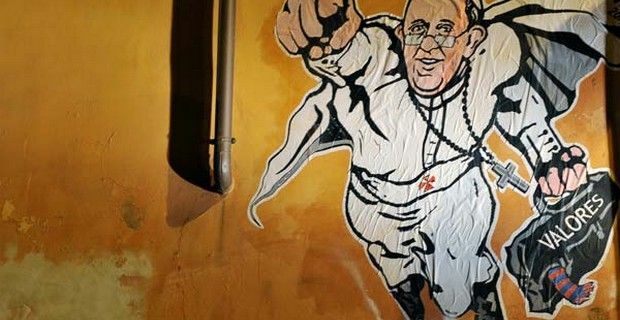 The Pontiff is now a superhero at least in the eyes of Mauro Palotta - a professional artist and sometimes street artist - who designed the graffiti on a wall in the heart of the historic Borgo Pio district near St. Peter's Square in Rome. The Holy Father is depicted in the typical Superman pose, with his fist raised and flying through the air with his white cassock and cape billowing behind him and carrying his black satchel, with the word 'Valores' (Spanish for values) written on it, and there's also a blue and red striped scarf of his favorite soccer team, San Lorenzo in the tribute. ‘Papa Francesco’ has been making a very noticeable break from Vatican tradition since his election last year .